With more than 800 restaurants on its menu, Richmond is full of options for hungry diners. But if you’re keen to plan a unique foodie adventure, the city’s budget-friendly food court scene offers an open invitation to ever-curious palates. Far from the generic chains dominating many Lower Mainland food courts, Richmond’s are lined with independent mom-and-pop counters serving a huge array of Asian street food-style dishes. And while Yaohan Centre, Parker Place, President Plaza, and others each have their own fans, the fancy-free upstairs food court at the Richmond Public Market is also worth exploring. Under the market’s gabled ceiling, there are a dozen or so colourful counters forming a perimeter around a seating area filled with small tables. Like most of the city’s food courts, many of these stands only accept cash. And keep in mind that while the market is open every day, individual counters may be temporarily closed when you arrive—but there are always plenty of alternatives if the stand you want to visit is closed. Read on for details on some of the vendors we encountered. 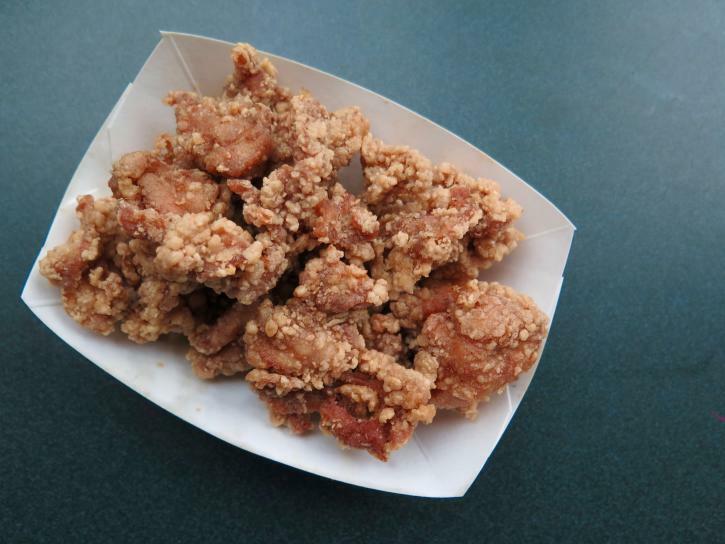 And if you’re not sure what to try, there are several highly competitive stands—from Captain Wa to Wonder Wok—serving great-value, pile-it-high Chinese combos, all of which were doing a brisk trade in heaping dishes when we arrived. Be sure to bring a shopping bag as well: the Richmond Public Market’s downstairs fruit and vegetable stalls are among the cheapest in the city. A recent addition to the food court—hence the bright TV screens rather than the more common faded photo menus—the friendly young staffers here are happy to explain your options. There’s a good selection of generously portioned hot pot dishes (including several vegetarian choices), but their noodle and rice bowls are also extremely popular, with some tempting sides including spicy beef salad and wontons in chili oil also available. Potelicious should also be commended for using compostable bowls, forgoing the standard Styrofoam deployed in many Metro Vancouver food courts. 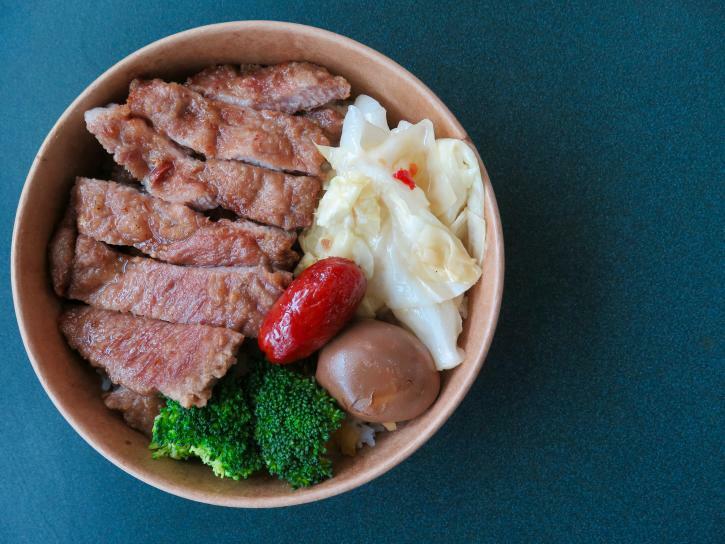 Don’t miss: The bestselling Railway Pork Chop Rice Bowl is topped with a large sliced pork slab plus vegetables, marinated egg, and a delicious little spicy sausage. Looking like just another home-style counter with rows of faded food photos, Xi&apos;an Cuisine is actually one of the market’s most celebrated stands. In-the-know regulars keep coming back for its thick, freshly hand-pulled noodles (available fried or in soup). Make sure you stick around after you order to watch your noodles being expertly stretched before your eyes. 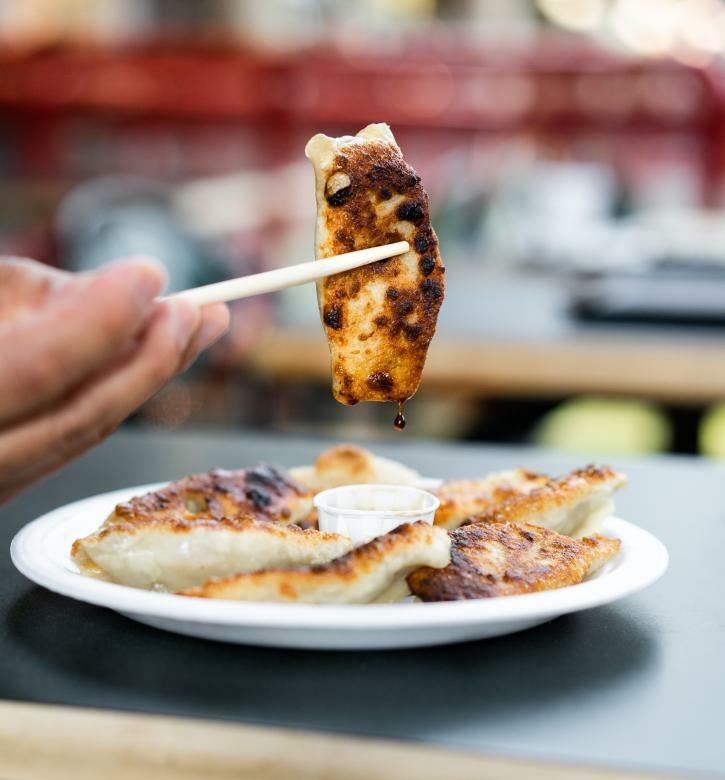 But that’s not all: there’s also a tempting array of comfort food sides to consider, ranging from Chinese pork burgers to green onion pancakes to delicious golden-fried pot stickers that are a favourite among regular diners. Don’t miss: The fried pork and chili noodle bowl is a hot and spicy delight that’s topped with heaps of juicy pork; and the pot stickers (guo tie) are actually highlighted on the Dumpling Trail. Build-your-own combo bowls are popular at this busy Taiwanese stand, where lineups are common at peaks times but usually move fast. Your protein selection (including chicken, beef, and tofu) is served in a red bowl with rice plus a choice of three sides from the counter cabinet: veggie dishes and marinated eggs included. You’ll also receive a steaming cup of tea. The combos are $11 or $12 each but there’s also an enticing selection of $5-to-$7 “snacks” that are perfect for sharing. These include chicken nuggets, deep-fried pigs intestines, and bowls of soup full of bulging meatballs. Don’t miss: The Taiwanese chicken nuggets are a winner. You can have them as a rice bowl main or a delicious side on their own—with or without chili topping. Served in chunky clay pots, the fortifying combos at this stand come in mini, small or large sizes; we found the $7.50 small portion ideal unless, of course, you haven’t eaten in a week. There are around 20 clay pot dish varieties to choose from here, with optional ingredients including pork, beef, chicken, salted fish, Chinese sausage, and more added to a hearty bed of rice—take your time to choose the mix that works best for you. Once you order, it takes about five minutes for your pot to be ready, giving you plenty of time to explore the nearby stands for your second course. 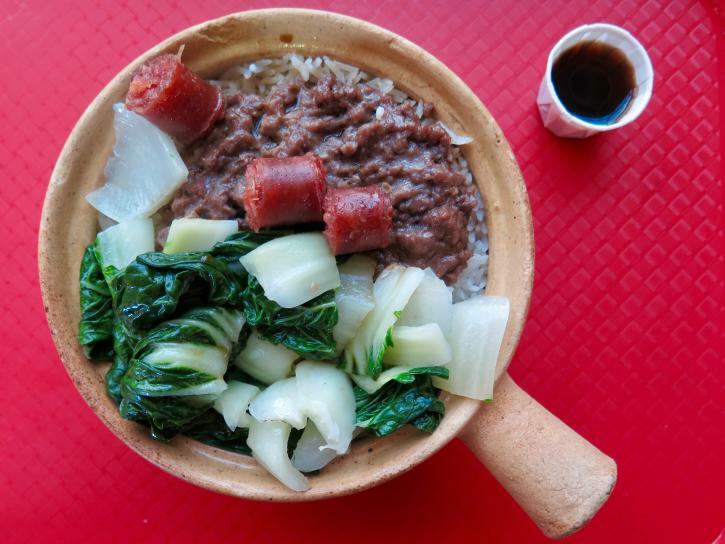 Don’t miss: The beef and Chinese sausage clay pot includes a hamburger-like beef topping, chunks of sausage, and a heap of glistening greens. Our dessert plan had been to buy some cream-filled wheel cakes at the food court’s ever-popular Peanuts Bubble Tea stand. These circular little Taiwanese treats come in varieties such as chocolate and red bean, and they often sell out quickly. But on our visit, Peanuts was closed for the day. Since desserts are not common at the food court’s other counters, we headed downstairs to the always-busy Pine House bakery stand instead. 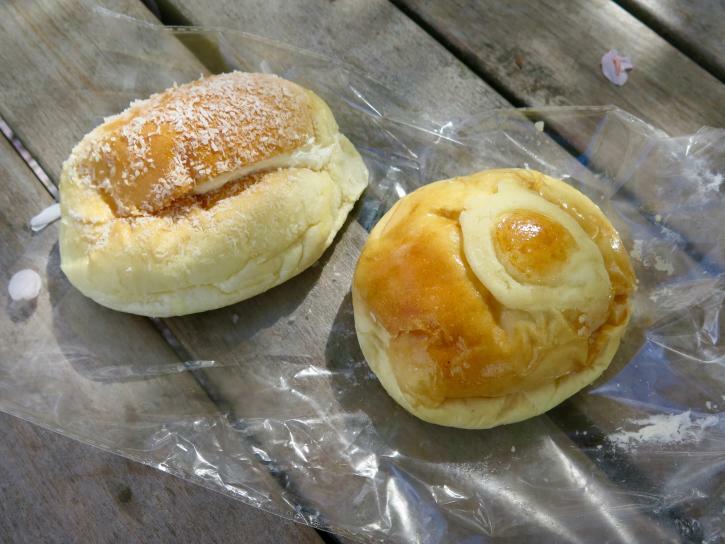 Lined with cases and trays of tempting treats, we bought a custard-filled bun and a coconut cream bun, then found a sunny table outside the market under the cherry blossom trees (at Lang Neighbourhood Park). Don’t miss: The treats are plentiful here and most items are just a dollar or two. The soft custard buns a great way to end your meal.